At Big Boys Toys we’re proud to offer a new deal of the week every week. Whether you’re looking for a travel trailer or fifth wheel, a rear bedroom or front bedroom, we’re sure to have something that works for you and a deal that is absolutely jaw dropping. If you’ve been waiting for a price drop to buy a new Travel Trailer, the wait is over. One of this week’s deals is a brand new 2017 Jayco Jay Feather travel trailer that has been slashed $4,000 to just $22,950. Or, if you’re in the market for a new Fifth Wheel, click to see this 2017 Highland Ridge Open Range Light slashed $10,000! 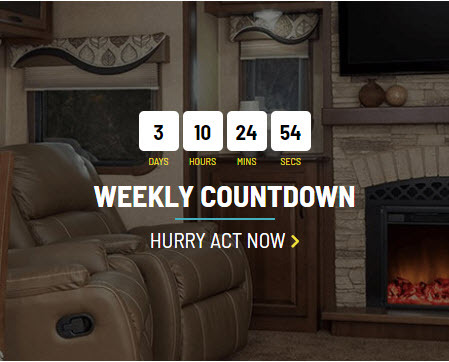 There are currently 12 RVs that have been discounted especially for our Deal Of The Week. If you can’t find what you’re looking for among our Deals, check out our impressive selection of new RVs and used RVs. Our experienced sales team is here to help you find an RV that meets the unique needs of your family, lifestyle, and budget. Contact us to learn more about our available RVs for sale in British Columbia or stop by to walk the lot and see our inventory up close.